Francis Ford Coppola returns to one of his favorite subjects — the relationship between a couple of very different brothers — in Tetro, his latest film and the first to feature an original Coppola screenplay since 1974’s The Conversation. 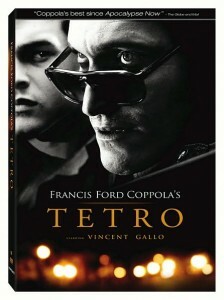 Tetro tells the story of the 17-year-old Bennie (Alden Ehrenreich), who travels down to Argentina to search for his missing older brother, an angry and moody poet named Tetro (Vincent Gallo in a typically angry and moody performance). Bennie ultimately finds Tetro, who’s living with his luscious girlfriend Miranda (Maribel Verdu), and quickly surmises that not all is as it seems and that Tetro harbors more than just a poet’s typical melancholy-for-the-sake-of-art temperament. In fact, it’s Tetro’s feelings about the brothers’ composer father (Klaus Maria Brandauer) and their past life that is the root of the problem. Shot primarily in rich black-and-white digital video with occasional bursts of lustrous color, Tetro is a hauntingly beautiful film. Indeed, Coppola’s view of Buenos Aires as seen through the eyes of the film’s Italian immigrant family is simply stunning. But the sumptuous visual style, along with a strange audio design by Walter Murch don’t always jibe with the family-with-a-past narrative. All the sounds, both dialog and effects, play almost too clearly, without any other background noise surrounding it. It’s odd, overall, and gives the film the feeling of an offbeat, uneasy dream. The production approach is a deliberate one, yes, and it’s definitely a kind of a challenge for Coppola fans, but it doesn’t always work. That said, Tetro remains a film from one of the great American filmmakers of the past half-century and is still worth the watch. A full heaping of supplements is also on hand on the DVD, led with a commentary by the always effusive Coppola and star Ehrenreich, and the inclusion of an extended version of the play Faust that appears in the film.